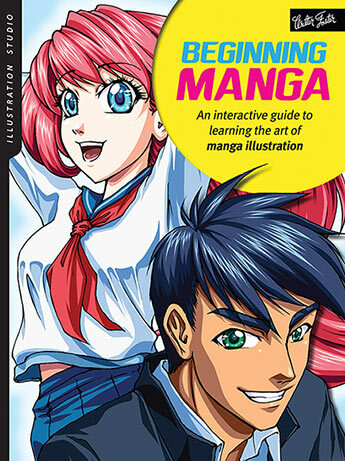 Learn to illustrate and create unique manga art in this fun and engaging, step-by-step book. Beginning Manga treats aspiring illustrators to a fun, interactive learning experience with a variety of creative prompts, tips, exercises, and engaging step-by-step projects. Starting with an introduction to tools and materials, readers learn new drawing and inking techniques, as well as how to work with color thanks to a variety of simple step-by-step projects and prompts designed to spark creativity and inspire artists to create unique manga worlds of their own. Included are templates and practice pages to assist with developing one's craft in addition to brainstorming, sketching, and collecting project inspiration. All of this and more make Beginning Manga the perfect resource for aspiring manga artists and illustrators. Aileen Strauch is a freelance illustrator and comic artist. Her style is a mix of manga- and anime-inspired art fused with fantasy elements. Aileen is a self-taught artist who has taught drawing workshops, given demonstrations for Wacom, and been featured in ImagineFx magazine and 1,000 Ideas by 100 Manga Artists. Learn more at www.kiwichameleon.com.